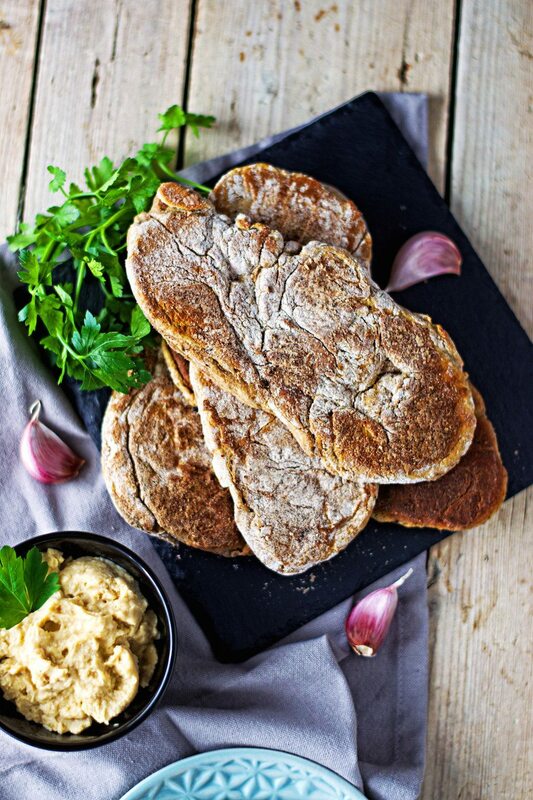 This Roasted Garlic Naan is an easy homemade bread that is an amazing addition to BBQs, salads, sandwiches, stews, or soups. Barbecue season is coming. With sunny weather and ever longer and warmer evenings, it’s an ideal time to bring out the grill and have a great time with family and friends. We have always had very homemade BBQs: prepping veggies, making fresh salads, and sauces, like this one here, or dips and spreads like my Coconut-Peanut Hummus, the Beet Hummus, or Hazelnut-Almond Hummus. One thing that has started to bug me about this, though, was the bread. More often than not, we’d just go to the store and grab a baguette or something of the sort. This time I really wasn’t all too happy about this any more: after a while, it’s all the same and also, frankly, I’m not sure what goes in there. Having heard stories about how stores and even bakeries don’t use pure ingredients but things like flour pre-mixed with artificial extras and what-not, I wanted to make a homemade BBQ bread. Something garlicky always fit my taste for these occasions and I had experimented with Naan before. It’s fairly easy to prepare a dough from flour, yoghurt and milk (of course, plant-based and gluten-free). This one had a more special flavor: I roasted a couple of garlic cloves in coconut oil for some minutes, then added the squeezed pulp to the dough. After that, it’s just a matter of baking the Garlic Naan in a hot pan until it gets this awesome browned color with a slightly golden touch. 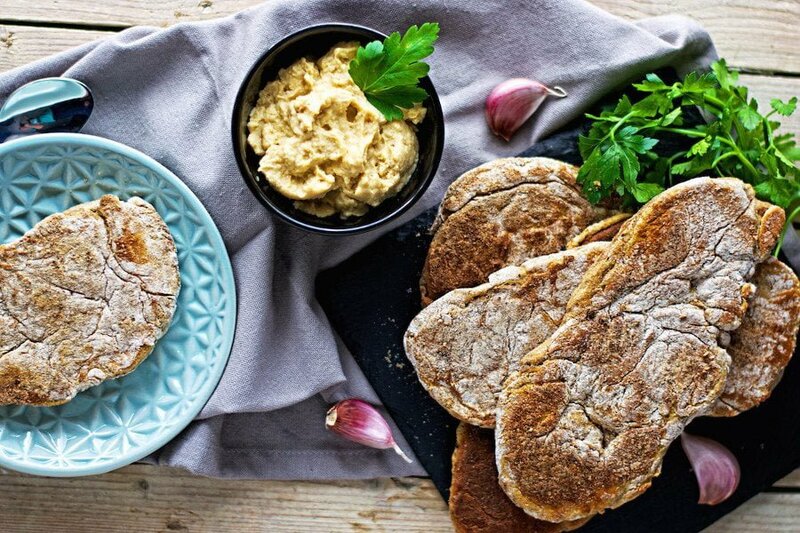 We enjoyed this Easy Roasted Garlic Naan very much with our barbecue. It’s also amazing for sandwiches, with salads, or as a side to stews and soups. So many ways to enjoy it! Do not miss it! If you enjoy a big slice, let me know. Let’s talk and tell me all on Instagram and Facebook. Snap a picture. Love seeing all your creations. Florian. Heat 1 Tbs of coconut oil in a pan. Peel the garlic and roast it in the oil for 3-4 minutes, then squeeze the garlic into the dough and mix. Indian breads are the best! I love that yours is already vegan and gluten-free. I honestly don’t know if I’ve ever had naan! I didn’t grow up with knowledge of Indian food, and since most contains dairy, I don’t eat it. I’ll need to give this recipe a go! Another gorgeous recipe, I adore garlic. I’m with you, store bought breads are iffy at best and usually tasteless. Saving and sharing this! I absolutely LOVE naan bread! It is to die for and your recipe is seriously amazing. I want to eat the picture it looks so good! I love that you made it gluten-free as I bake and cook everything mainly gluten-free. I’m curious though, since all flours are SO different, what brand or mix did you use? I’d love to try this sometime! I’m originally from India and though some may recognise this is not authentic Indian naan, I thought I should offer my warning. Real naan is made in a tandoor oven and it very much is not vegan. So, enjoy the recipe, but don’t be sad if this doesn’t taste like what you may get in a restaurant. It definitely does not look like what I have seen made in India. Neither the color nor the consistency match the real thing. That said, good job on the recipe. Naan (not naan bread as some have called it) is considered a bit of a delicacy in India. Even more so than parathas, which admittedly are a staple in the north, and definitely more than the humble roti. We love curry which means we also love naan and use it to soak up all the yummy sauce. Love your vegan spin on this! Delish! Love this recipe! 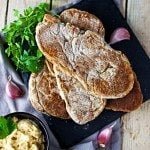 It is so great to see a vegan recipe for naan. Sure, it won’t be quite the same…but it is a great option for us to have available for our vegan friends! Thank you, hope you give these a try! 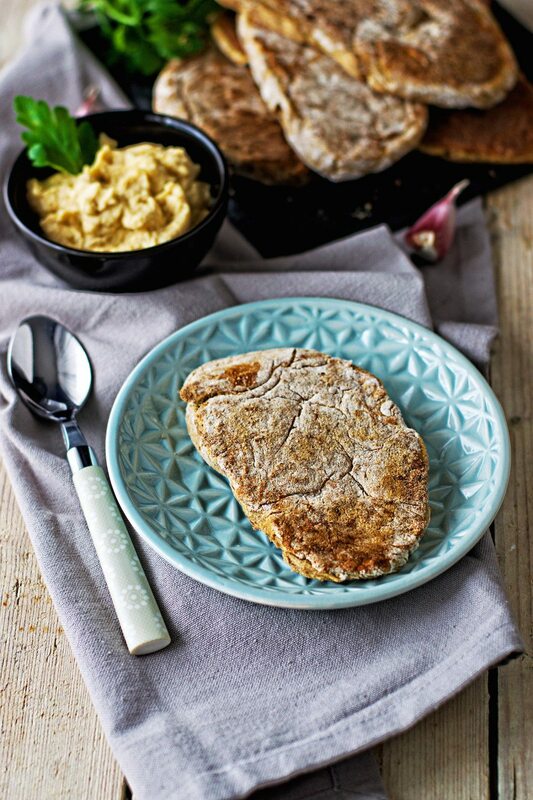 I love naan bread and I love this variation! My family devours naan whenever we have Indian food, but I’ve not tried it myself. Must remedy that. You should give these a try, Kirsten! It is so easy to make and delicious! What is it with store bought bread? I went to the bakery of an upscale supermarket last week to buy hamburger buns for my vegan sloppy Joe recipe and every one had milk and high fructose corn syrup, and they were fresh from the oven! I had to go to the packaged bread aisle to find buns that were vegan. This looks delicious and healthy Florian. I will definitely give this recipe a try. Thank you! I hear you, Linda! It is absolutely tricky and often not easy to find a bread or baking good that you can trust. You have a look at the ingredients (if possible), then there are many artificial flavors or processed additions, something you don’t want to have in your bread. I think the problem in general is: one assumes that an upscale market has the best quality, but in reality a higher price segment doesn’t mean the best quality on products or produce. For me I tend to make sure the label I buy is 100% organic so I can be certain there isn’t any bad stuff inside, or better I bake my own as often as possible! Naan bread is one of my favorites. I have to try this version. Your bread looks wonderful, Florian. Awesome, Catherine, let me know how it turns out! This looks great! I’ve made garlic naan before, but never ROASTED garlic naan. YUM! This sounds so good! I love naan. Is it 2 tablespoons of baking soda? I’m worried it will be too strong of a taste. Hi Christine! Yes It’s 2 Tbs of baking soda, but you will not taste it. If you have any concerns, reduce the amount of baking soda to your own taste. I can’t vouch for the results, because I haven’t tried this that way. Hope that helps! Awesome! Let me know what you think, Christine! Could u substitute almond milk for oat milk in this recipe? I believe it should work. Might give it a touch of a different flavor but I guess it will hardly be noticeable due to the roasted garlic. Hi Natasha! I’ve never tried that before in the oven and wouldn’t recommend this. I would suggest just use a tiny amount of oil, but without oil it won’t work. Let me know how it turns out.